There are three types of earphones; those that look good, those that sound good, and those that look and sound awful. The Shure SE535 earphones sit firmly in the second category. Stylish and good-looking they are not, but they do sound utterly fantastic. At £350 they're certainly not cheap. If you're looking for some iPod-replacement earphones these probably aren't for you. They're bulky and can be a tad fiddly to put in your ears. 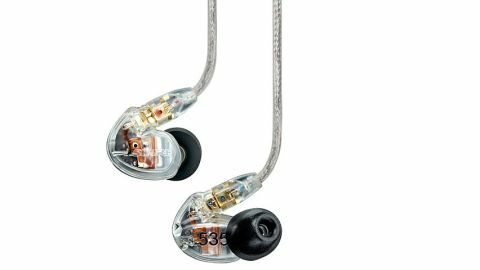 But if you're an audiophile or at the very least someone who appreciates well-rounded, natural-sounding high-bitrate music, these earphones are brilliant. The units themselves are fairly chunky. They need to be – each one contains three separate drivers - two woofers and a tweeter in each one. This makes music played through the SE535's shimmer with crystal clarity. The highs are crisp and clean, the bass is deep and silky smooth, while the oft-forgotten midrange is full-blooded, meaty and wholesome. It's only when you treat yourself to a pair of earphones like this that you realise how good music can sound. That said, if you're listening to low-bitrate MP3s, you needn't bother. These earphones show up the inadequacies of compressed music more than any other earphones out there. Unless you're listening to decent source, the extra money you'd pay for these isn't worth it. Our test album for these earphones was a FLAC copy of The King of Limbs. It's a well produced album which does a great job of showing off the ninja audio skills of these high-end earphones. However, as we alluded earlier, they can be a bit of a fiddle to use. It takes a bit of practise to perfect the installation of each unit into your ear. And if you've got long hair, it's even more difficult. Like other Shure earphones, the bud is inserted into your ear drum and the cable is designed to go up and over the back of your ear. It's not as simple as popping them in and out like a pair of iPod headphones. That said, is the effort worth it? Of course it is. These earphones are brilliant, and if you can afford them they'll do your music justice in ways most earphones can only aspire to.